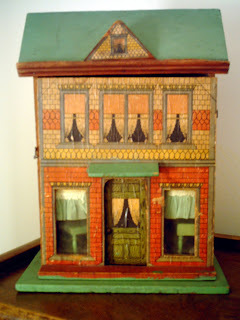 Dollhouse and Miniature Dolls, 1840 - 1990, by Marcie & Bob Tubbs with Dian Zillner. Published by Schiffer Publishing, May 28, 2009. 256 pages. 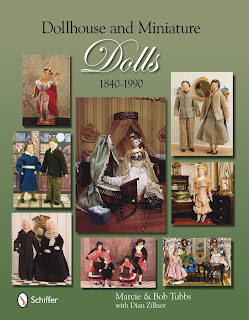 Here's a book long-awaited by dollhouse collectors: an entire volume devoted to dollhouse and miniature dolls. While there have been brief chapters on these dolls in books about dolls or dollhouses, this is the first work I'm aware of that is entirely about them. And quite a comprehensive work it is, covering miniature dolls made of every imaginable material: bisque, wood, china, paper, plastic, rubber, composition, celluloid, vinyl, and more. 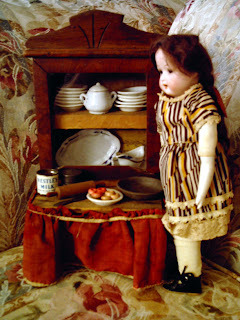 Dolls dating from the Victorian period up to modern days are featured, and countries of origin include Germany, Britain, Japan, America, and others. Really a delight to peruse, this book will entice readers into its enchanting small worlds. 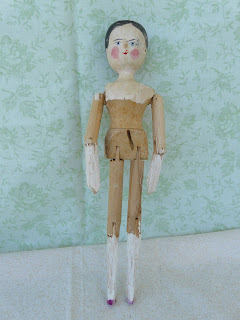 Dating from the late 1800s or early 1900s, this German-made peg wooden doll (also known as a penny wooden) just charmed me. Her clumsily painted face resulted in a quirky, whimsical expression, and her handmade, period-accurate dress is just beautiful. 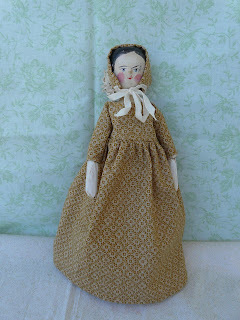 I've wanted one of these historic dolls for a long time, but the right one just never came along, until she showed up. I think this individuality is one of the greatest features of old, handmade toys: even though these dolls were made by the thousands and churned out rapidly, each one is different and unique in her own way. 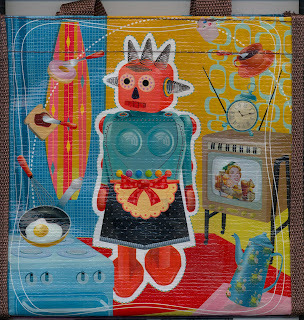 Check out this cool new lunchbag I just found at Border's: all kinds of robot-y, 1950s kitchen-y, kitschy goodness! Another addition to my growing collection of toy grocery stores, this is my first German shop. Dating from the 1930s, with a great deco design, it measures about 15 inches wide by 13 inches tall. The little wooden drawers still have their original handles and labels for salt, pepper, rice, pickles, cookies, and tea. It came with some lovely accessories: miniature boxes of Knorr products (soup mixes? ), tiny tins (for cookies? ), a cheese on a glass dish, and a fantastic and very old compote of fruit. A 1920s Schuco bear watches over the cheese and sausage counter. This past Saturday, I went yard saling and scored some great finds. One of the best was this hard-to-find vintage Star Wars playset, Land of the Jawas, from the first movie. No one I knew as a child had this set; I didn't even know it existed until I was a grown-up toy collector. It's a relatively scarce piece because half of it, the sandcrawler backdrop, is made of fragile cardboard. I love, love, love vending machine toys: to this day I can't go to the grocery store without checking out the machines by the door and feeding them fist fulls of quarters. Mere words cannot describe how incredibly satisfying this toy is. Dating from 1965, BASH! was one of the hardest-to-find games on my wish list. Now that I have it, I can't get enough of it. Game play is simple: stack up the yellow and red plastic slices that comprise the BASH man's body. Then, using the special hammer, take a WHACK at the slices, trying to smack one the heck out of there! If you do it right, it's like that old gag where someone yanks a tablecloth off a crowded table without any of the dishes falling: BASH's head will simply plop down onto the remaining slices. But if you do it wrong, the whole thing crashes apart in a magnificent cascade of clattering plastic. It took me a few days to get the technique down, but now I can BASH happily away, thinking all the while of things that are stressing me out. A few WHACKS and the stress is gone! Loads cheaper than therapy, I highly recommend a few sessions of BASH for all your troubles. I loved Colorforms as a child, and still do today: they're a great calming, soothing stress-reliever. (Try it, you'll see!) 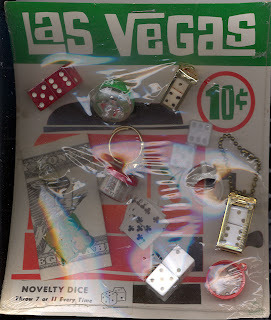 This set, Twisto - Change-O, was introduced in 1972, and featured an innovation for the Colorforms line. After suiting up the little boy, you turn the red knob on the Twisto - Change-O machine, and different faces appear where the boy's head is, courtesy of a cardboard wheel under the picture featuring several different faces that revolve into view. Simple yet ingenious and lots of fun to play with, this device was used again in Colorforms' Tricky Mickey Magic set (which I'll try to post soon. It's way cool...). I love old games, and this was one of my most unusual finds. Dating from the 1920s or 30s, it's called "Deck Derby," and is made of beautifully lithographed tin. It folds down to form a more or less oval race track, and includes pressed tin horses and fences. The game play is pretty simple: roll the lovely old dice and move your horse around the track. There are lots of old horse race games out there, but this one is unique in its apparent intended use: on a cruise liner! The center of the board features a fantastic illustration of elegant travelers at play on the deck of a steamship, and the horses and fences include magnets which hold them firmly in place, a precaution against loss on rough waters. Collector's Guide to Housekeeping Toys, 1870-1970, by Margaret Wright. Published by Collector Books, January 2007. ISBN 978-1574325409. $16.95. 285 pages. While not a comprehensive reference source, this charming paperback provides a fun introduction to its topic, presented in full-color with great, crisp photography. Toys covered include American-made stoves, miniature cupboards, grocery stores, cookware, tea sets, wash day and housecleaning items, and much more. 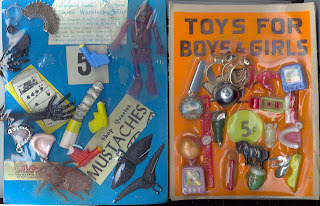 The author admirably conveys her delight in these objects as both simple toys and important sociological artifacts, writing in the introduction: "toys...are historical documents...American history can be taught with 20 items on a table, beginning with an 1880 cast-iron stove and ending with a plastic tea set, components of the Industrial Revolution and modern technology." Her love for these toys is infectious: you'll find yourself wanting to "play house" after you finish reading this wonderful little book! "Beyond the universal and age-old affection for things small, the fascination with miniatures seems to have a special significance for us today. The modern world is bewildering in its complexity and fraught with dangers, which the news media confront us with daily. At times, too, our society seems grossly insensitive to its heritage, paving over the past with scarcely a glance backward. It's the kind of world -- unsentimental and beyond our power to influence -- that we take pleasure in escaping from occasionally. Miniatures provide the perfect retreat. They take the rough edges off of reality. They allow us to preserve the past by recreating it. And, they give us control over a tiny world of our own making, where everything is just the way we want it, with ugliness and inconvenience walled out. In our miniature world, roofs never leak, rugs never fall victim to cigarette burns, beds never need making, food never spoils. 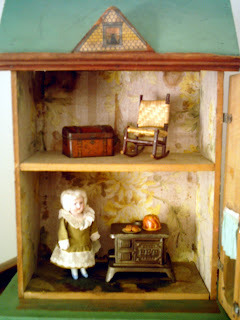 As one collector put it: 'The only perfect thing in my life is my dollhouse. It's there. It's controllable. It's security.' "
I'm a sucker for "love-worn" teddy bears...they just look like they've given their all, and now they deserve some care in return. How anyone can throw out a battered teddy is beyond my understanding! Still, this one was damaged well past even my high tolerance level. 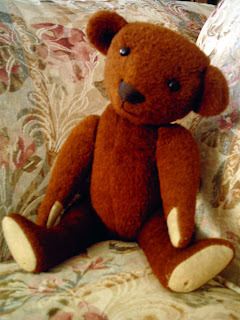 But I bought him anyway, because he's a very rare and special teddy: an American 1920s Sleep Eyed Bear. When I found him, I had never seen a Sleep Eyed Bear (SEB) for sale in over 20 years of collecting, and I thought, "well, I can probably fix him. How hard can it be?" As it turned out, quite hard, and eventually SEB was sent away to a professional teddy bear restorer. A month later, SEB could hear out of both ears, smell, and smile, and he also felt much cleaner and sturdier. It was a truly amazing restoration. Sleep Eyed Bears, when found, are usually damaged, because of the fragility of their internal mechanism. The head contains a metal framework that holds the celluloid eyes in place. When you tip the bear back, the eyes roll into a closed position. 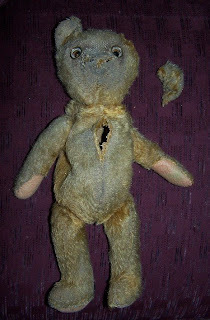 It's pretty ingenious, but also hard on the bear: the fabric tends to strain against the metal, resulting in tears over time, and if the fabric gets wet, the metal causes terrible staining that looks like...well, like poor Teddy has been a homicide victim. Thankfully, this one was saved and is now living a comfortable retirement, beguiling the other bears with stories of his trip to the restorer. 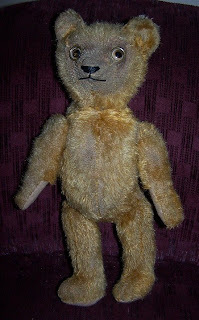 Introducing one of my very favorite antique teddy bears: "Barney", made by the American manufacturer, Hahn & Amberg, c.1907. Barney is a really unique bear, in a very desirable cinnamon shade. He's unusually made of a thick woolish fabric, similar to antique upholstery material, and is stuffed with shredded cork, which gives him a certain heftiness. I've wondered if his materials are partly responsible for his amazing preservation: Barney is practically mint. He measures about 13 inches tall, and has a happy, smiling face, very different from his stern German contemporaries. I just love these little toy grocery shops! 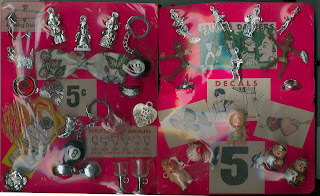 They're perfect for using in displays with small antique dolls and teddy bears (who like shopping too, you know!). I'm thinking this is American, probably from the 1940s, and many of the products shown are original. The set measures about 10 1/2 inches high. The little cans and packages are all wooden with paper labels, while the breads, ham, and steak are plaster.